The Espruino has shipped to its Kickstarter backers, and Tessel is on schedule to ship by May, and we’re about to get our hands on pre-production Tessel hardware and you can expect an in-depth review soon. Despite the explosion of new boards coming to the market—and because of the community that’s grown up around them—I’d without hesitation recommend the Arduino, if you need an 8-bit micro-controller board, or the Raspberry Pi if you need a single-board computer running Linux. It’s those communities that make the Arduino and the Raspberry Pi so useful, any problem you might come across it’s likely that someone else has come across it already and the solution, or at least the key to the solution, is already waiting for you and is just a Google search away. Logically then, the only way for a new board to succeed is to either take over one of those existing communities, create its own community, or co-op a community that already exists but isn’t tied to an existing micro controller. Right now there are two new micro-controller boards seeking funding—one on Kickstarter, and the other on Dragon Innovation’s new crowdfunding platform—that are slightly different. 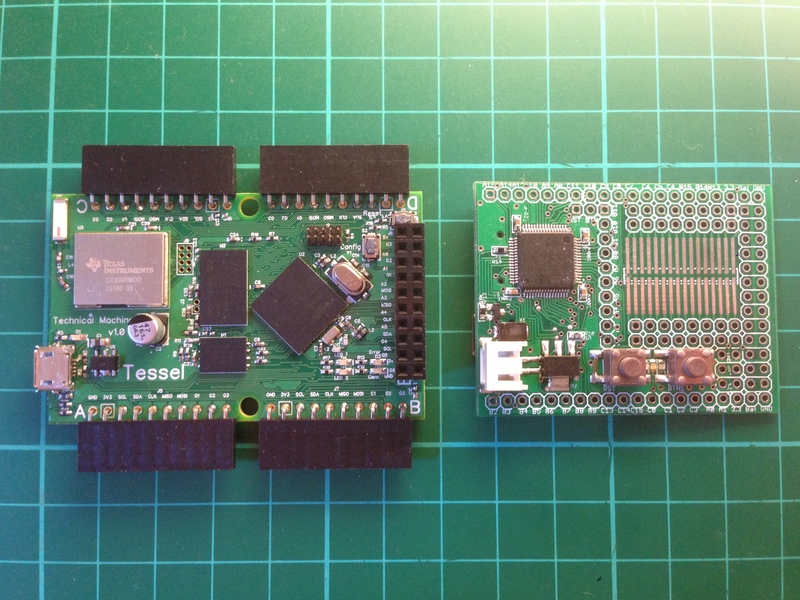 These boards aren’t just yet another Arduino clone, or yet another possible “Raspberry Pi killer.” These two boards, the Tessel from technical.io and the Espruino from Pur3, intend to take the path least travelled and co-op an existing community not traditionally associated with the maker community. It’ll be the end of the month before the crowdfunding efforts for these boards close out, although both have already doubled their funding targets, and the start of next year before the maker-in-the-street will see final production hardware. However one of the advantages of working for Make is that sometimes you get to try hardware before other people, and I have pre-production prototypes of both the Tessel and the Espruino boards sitting on my desk right now—one of twelve in the case of the Tessel, and one of just two in the case of the Espruino. Class A modules (top) and the more expensive Class B modules (bottom). The Tessel from technical.io was one of the eight products which launched the new Dragon Innovation crowdfunding platform last week, and the first to reach its funding goal. The Tessel is aimed on high end of the gap between the Arduino and the Raspberry Pi, squarely at Internet-connected applications targeting physical devices, and has WiFi built-in. That means not only that the board is always online, allowing it to be used as both as a server and a client, but you have the ability to remotely deploy your code onto the board via the network. As well as standard GPIO bank at one end—which includes SPI, I2C, and UART capability as well as 6 General Purpose Input/Output pins, 6 Analog to Digital Converters, a 5V pin, a 3.3V pin, and a ground pin—the board supports a module system, making it easier to add capabilities to a project without soldering. There are two types of module, both have the same connector. Class A modules—a Relay, Temp/Humidity, Servo, Accelerometer and micro-SD Card board—and slightly more expensive Class B modules—RFID, Bluetooth LE, GPS and Audio boards. My pre-production Tessel came with a Servo Module, which requires a second power supply dedicated to the servos. The Tessel board with a Servo Module driving a standard servo. The board leverages npm and the sprawling node.js community—just install the servo module using npm into your node.js installation and then push your code to the Tessel board using the Tessel npm package. But it’s not just their own infrastructure that makes use of npm, the board is going to be compatible with thousands of existing node.js modules available via npm. The fact that it’s node.js compatible may be a big factor in the success of the Tessel board, the node community is large, enthusiastic and—as can be seen from efforts such as nodecopter and Johnny Five—already open to working with hardware. That’s a big win for the Tessel, they have an instant community behind them. That counts for a lot. What’s the goal for the Tessel project? Our goal is to make hardware development a natural proposition for software developers. A huge part is enabling web and mobile developers to be able to use their existing skillsets to control the physical world. What’s the underlying architecture of the Tessel board? For example, the majority of our peripheral (mostly SPI and I2C) code clocks in at about 50 or 100 lines of commented code. Our runtime even gives us the proposition of doing simulation right on your command line before you deploy code, giving web developers another familiar tool, automated testing. To get started with any module we manufacture is as simple as “npm install accelerometer-mma8542q” and requiring it in code. Our development and deployment expeirence is being designed to be just a few steps out of the box to having a working example—plug in library, download command line tool, deploy. What’s are your future plans? The top of the Espruino board showing the ARM Cortex M3 CPU, the JST 2 pin battery connector and the two on-board buttons. The bottom of the Espruino board showing the micro-SD card and mini-USB connectors. Launched a few days ahead of the Tessel on Kickstarter, just at the end of August, the Espruino board from Pur3 is significantly cheaper than the Tessel. At £19—that’s around $30—it’s actually less than half the price of the Tessel board. Of course the specification of the Espruino is much lower. Although they both have ARM Cortex-M3 processors, the Espruino has just 48KB of SRAM compared to the Tessel’s 32MB of SRAM. While the Tessel is aimed at the high end of the gap between the Arduino and the Raspberry Pi, the Espruino is aimed at the lower end, but it’s priced to match. The Espruino board with an SMD H Bridge chip and connectors to drive a motor. The Espruino board with a HC-05 Bluetooth module in the prototyping area. The Espruino board with extra header blocks soldered into the prototyping area setup for driving multiple servos. The Espruino is an interesting departure from most modern boards. Unlike the Tessel—or the Arduino—you don’t upload your code to the board. Instead you have an interactive interpreter. Plug the board into your Mac or PC, and connect to the board over the USB serial port, and you’ll be presented with an interactive console. You can use the interactive console in exactly the way you’d expect—and in a way that will be really familiar for those of us that grew up with computers running BASIC—just type your code at the prompt. Since the Espruino is entirely event-based that means that you can write functions that you can modify and add to while they are running. With the Espruino you don’t upload code to the board, instead you interact with it. Once set up this function will watch for the button press event in the background, and you’ll be returned to interactive prompt. Exactly as you’d expect. In the same way the Apple ][+, and to a lesser extent the TRS-80, ware familiar sights in US schools, in the UK during the 80’s and 90’s schools had the BBC Micro. It left a lasting legacy, and despite not being explicitly marketed towards education I think this board is a must have for schools, and to teach people programming. The Espruino, perhaps even more so than the Raspberry Pi—another UK-based project aimed at schools and teaching children to program—is a worthy successor to the BBC Micro. The Espurino has an interactive interpreter, why did you do things that way? I really like C, but when you’re writing compiled code for microcontrollers there’s a real disconnect between you and the microcontroller – it’s running in a black box, and the only way you can interact with your software as it’s running is by adding yet more software (or maybe by using a debugger). As an example, I made a box to control the variable valve timing on my car’s engine, but 90 percent of the effort involved in that was actually in adding code so that I could check what it was doing and adjust values while the engine was running. If you have an interactive interpreter then that’s all done for you. Why is an event-based model better than the loop-based model that the Arduino and other controllers use? Using an event-based model has several great advantages.t means different bits of code doing different jobs can run together without interfering, and you can edit code in-between processing of events, rather than having to break out of the main loop. It’s more intuitive because it mimics the way people naturally describe tasks in the real world, for instance “When it is dark, turn on the light” rather than, “Is it dark? Is it dark? Is it dark? Yes. Turn on the light!” and it’s a good fit for the graphical programming environment because it’s more modular. Finally it cuts power consumption drastically, so it’s great for battery life. Writing my own interpreter was really necessity rather than choice. If you look at the memory requirements of the main interpreters like V8—used by node.js—and SpiderMonkey, they’re pretty huge – in the region of megabytes. They also have hooks into the underlying operating systems, so trying to run them on a small devices such a micro-controller—with around ×1000 less RAM—without an operating system is nearly impossible. The Espruino uses ARC rather than garbage collection, it just fits nicely with the way the interpreter works, and it makes almost every memory allocation/deallocation very fast—especially as all blocks are equal size. It leads to an interesting point about these ARM microcontrollers. Espruino runs at 72Mhz with 48KB of RAM, so at a very rough estimate it can read every single byte of its memory in around 1ms. Compare this to a Raspberry Pi with 800Mhz and 512MB of RAM with a read time nearer 1 second—this means you have to think about how you handle data completely differently, and it’s one of the reasons that I couldn’t easily use an existing interpreter. A lot of Kickstarter projects have problems scaling. If your project is a runaway success, are you ready? Yes. I’ve got a production ready board that I can send to Seeed Studio, it’s ready to go. Over the last two months we have worked with Seeed to improve our design and, sourcing components from Seeed’s Open Parts Library, to ensure we are not compromising on quality. This has enabled us to produce the design for the current version of the Espruino Board. However if the project got significantly more funding than expected, it would be great to bring someone in to help with the tutorials and documentation side of the Kickstarter. I think it’s all about giving people places to start, like the electronic dice project on our Kickstarter page. If we reach £50,000 on our current campaign we will be adding support for the CC3000 WiFi module into the Espruino board. We won’t be producing a WiFi shield—we’ve got to focus on Espruino itself—but we will be adding support for the CC3000 into the Espruino board’s software before it’s shipped out to you. This means you’ll be able to buy a pre-made module, plug it in, and have instant internet access. But I’m also tempted to build a “shield-shield” which would slip underneath the Espruino board to give it an Arduino-compatible pin out. Going forward I’m also interested in building a much smaller version of the Espruino board. Do two boards make a trend? Two boards might not make a trend, but I won’t be surprised to see these two boards inspiring a new generation event-driven micro-controllers—so these two boards just might.